A Sea Launch Zenit 3SL rocket launches from the Odyssey platform in the Pacific Ocean, but fails to carry its payload, the Intelsat 27 satellite, into orbit on Feb. 1, 2013. An investigation into the launch failure is underway. PARIS — A commercial Sea Launch rocket failed 40 seconds after liftoff from its floating launch platform in the Pacific Ocean on Friday (Feb. 1) destroying the Intelsat IS-27 telecommunications satellite and compromising Sea Launch's long road to recovery from its previous failure in January 2007. Now headquartered in Bern, Switzerland, and owned by an affiliate of Russia's RSC Energia space-hardware manufacturer, Sea Launch AG had emerged from Chapter 11 bankruptcy restructuring in October 2010 – a reorganization that was an indirect consequence of the 2007 failure – and returned to flight in September 2011. 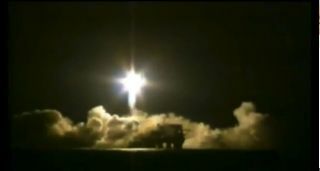 Friday's launch failure occured just after the company's Zenit 3SL rocket lifted off from its launch platform at 1:56 a.m. EST (0656 GMT). With a new lease on life made possible by the backing of the world's largest and third-largest commercial satellite fleet operators, Intelsat of Washington and Luxembourg, and Eutelsat of Paris, respectively, Sea Launch conducted five successful launches through December 2012 – three for Intelsat, two for Eutelsat. The only customer whose launch may be affected by the Thursday rocket failure is Israel's Spacecom satellite fleet operator, whose Amos 4 telecommunications satellite is scheduled for launch on a Land Launch rocket in July. Intelsat's IS-27, a Boeing Space and Intelligence Systems 702MP model weighing 6,215 kilograms at launch, was to have been operated from 55.5 degrees west longitude, where it would have replaced Intelsat's Galaxy 11 and Intelsat 805 satellites. Intelsat said in a Feb. 1 statement that services from these satellites will continue as usual. Intelsat is one of several satellite operators that are using L-, Ku- and Ka-band to develop a mobile satellite services business with maritime and aeronautical customers. Whether the IS-27 loss will affect the contracts Intelsat has signed for mobile satellite services was not immediately known. The company said in its Feb. 1 statement that it is "committed to working with customers to identify the most appropriate solutions for service continuity."